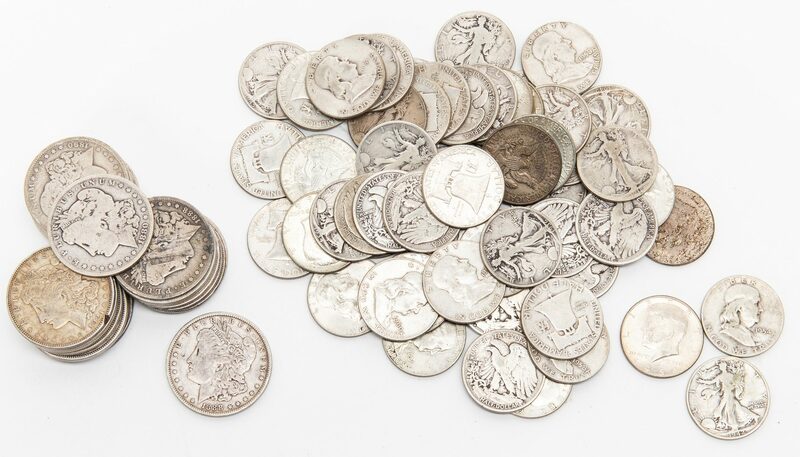 Eighty (80) Morgan, Walking Liberty, Franklin, and Kennedy Silver Dollars and Half Dollars. 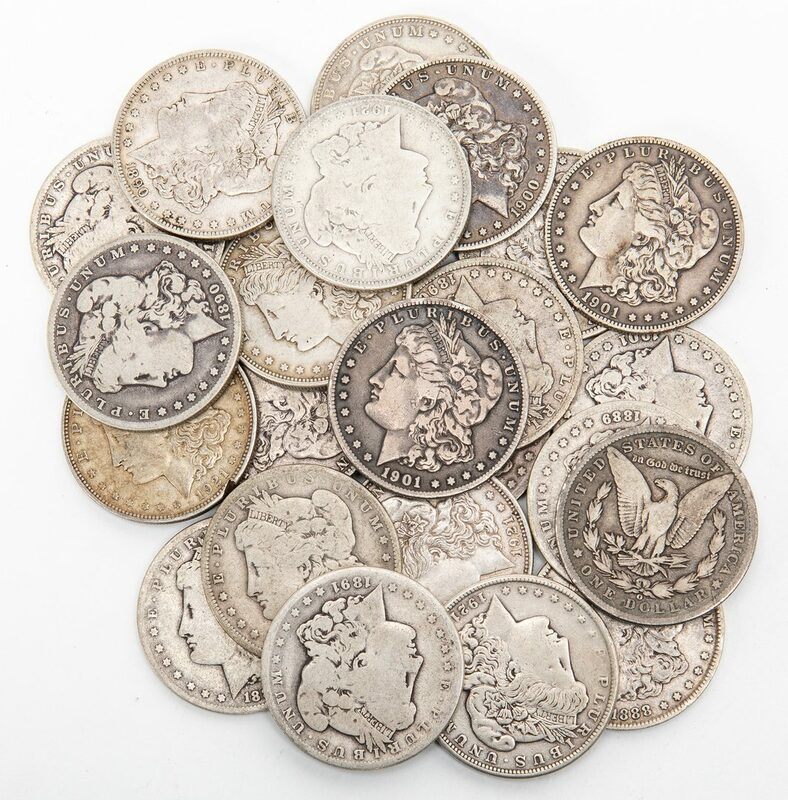 1st-23rd items: Twenty-three (23) Morgan Silver Dollars, including one (1) 1880, one (1) 1882, two (2) 1888, two (2) 1889, four (4) 1890, one (1) 1891, one (1) 1896, two (2) 1900, three (3) 1901, and six (6) 1921. 19.35 total ounces troy. 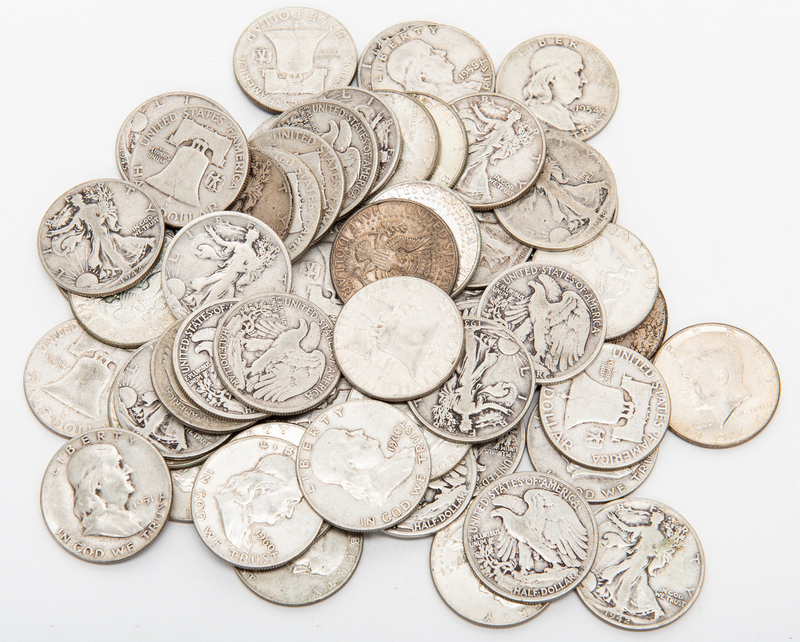 24th-48th items: Twenty-five (25) Walking Liberty Half Dollars, including two (2) 1918, two (2) 1934, one (1) 1935, two (2) 1936, one (1) 1937, one (1) 1940, seven (7) 1940, two (2) 1943, two (2) 1944, three (3) 1945, one (1) 1946, and one (1) 1947. 9.80 total troy ounces. 49th-73rd items: Twenty-five (25) Franklin Half Dollar, including one (1) 1948, one (1) 1950, eight (8) 1951, one (1) 1952, one (1) 1954, two (2) 1958, two (2) 1960, two (2) 1992, and seven (7) 1963. 9.95 total troy ounces. 74th-80th items: Seven (7) Kennedy Half Dollars, 1964, 2.81 total troy ounces. 41.91 total troy ounces for all coins. Provenance: the collection of Benjamin Dysart, Brentwood, Tennessee. CONDITION: Circulated condition.